Thinking about my Grandma today as July 1st gets closer. She has been gone almost 30 years and it seems like yesterday that she was here. I imagine us sitting in her kitchen in Anaheim waiting for cookies to come out of the oven, or making jam, or having a good chat. I wonder what she would think of my art quilts and how I've progressed from doll clothes, to making my own clothes, to making nine patches, to art. I think she would have been happy about how I have evolved. 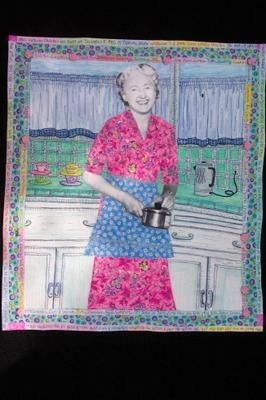 Making this quilt brought her back to us in a way - remembering her and all the things that made her special. All those great memories of family parties, card games, cooking, swimming, Disneyland, pink roses, growing sweet peas and teaching me life skills that I have passed on. She lives in me through my passion for my art, my family and in my daugher, her name sake. What a beautiful tribute to your Grandma! I love the contrast between the black & white photo effect and the bright colors. I loved your Grandma...brought back wonderful memories of spending time with you in her home.